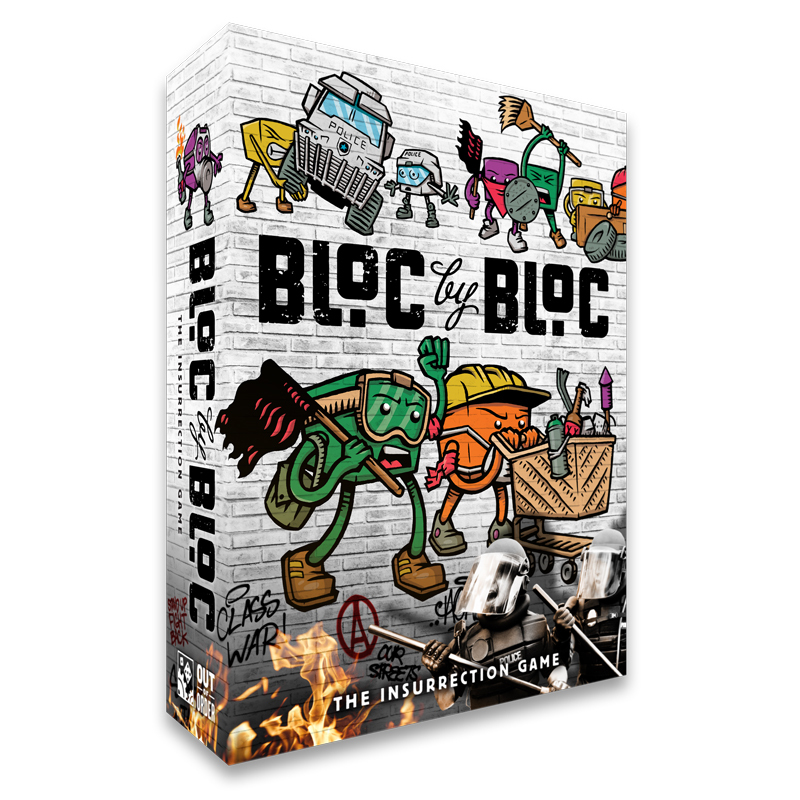 Bloc by Bloc: The Insurrection Game is a game by Rocket Lee and Tim Simons, published by Out of Order Games. It is for 2-4 players. In this game, players will be joining a popular rebellion that is struggling to liberate an ever changing city. Players will control a faction of revolutionaries as they fight against the State. They will be working together either fully or semi-cooperatively to take back their city before the military arrives to shut it all down. In the end, winning is determined by the type of game played. Before I begin, this review will mainly focus on the beginner game for 4 players. For more information on the various types of gameplay and more advanced rules, check the rule book or website. To begin, the beginning city is built by shuffling the manifestation cards and placing them one by one face down into a 5 x 5 grid. The beginning district tiles are placed on top of these with the “Liberated” side face down as per the set up instructions in the rule book. The remaining unused manifestation cards and district tiles are returned to the box. The countdown panel is placed next to the city with the countdown marker placed on the 6 nights left space. The loot cards are shuffled and placed face down next to the countdown panel. The loot tokens and barricades are placed in separate piles within reach of all players. The action dice and reaction die are placed near the city. A riot van is placed in the Stadium district along with 3 riot cops. A riot van and 3 riot cops are also placed on each State district with a white circle on them. The police morale panel is placed next to the city along with any remaining riot vans and riot cops. These are placed in the staging area of the police morale panel. The police morale marker is placed under Timid on the morale track. 2 Paramilitary Operations cards are removed from the police ops cards which are then shuffled and placed face down next to the police morale board. The 2 removed cards are returned to the box. Players are randomly assigned a faction and receive the matching faction mat as well as 5 occupations and 10 blocs that correspond with their mat. Players are also given a cheat sheet and are dealt 2 loot cards face down. Players will be playing fully cooperative in a beginning game so no agenda cards will be needed. These can be returned to the box. Players now choose one of their own districts as their starting location. They will then place their start occupation in their chosen district’s occupation circle. One of their blocs is then placed next to their start occupation. The first player is chosen and they receive the first faction marker. Play now begins. In the beginning game, the game is made up of 6 rounds. Each round consists of 1 night which is divided into 2 phases; the sunset phase and the sunrise phase. The first phase is the sunset phase. In this phase each faction will take a turn. This turn is made up of 3 steps; roll action dice, faction actions and police ops. The first step is to roll action dice. The player first places a bloc from their faction mat onto their start occupation. They will then roll a number of dice from 3-5 depending on the number of blocs they now have in the city. The dice rolled are then able to be used in the next step to take actions with. Each die rolled is an action. The next step is the faction actions. In this step the player can take actions using the previously rolled dice, however they are only allowed to take actions in districts where they have blocs located. It’s possible for the player to take the same action multiple times. Actions are also allowed to be taken in any order. There are 3 types of actions; basic, advanced and attack actions. Basic and advanced actions may not be taken with blocs that are in a clash, while attack actions may only be taken by blocs in a clash. A clash is when a bloc is in the same district with a riot van or riot cops. The first type of actions are basic actions. These are movement and barricade. Movement allows the player to use an action die of any value to move a single bloc or several blocs that are in the same district to another district. There are a few regulations blocking movement including not being able to move through a district that contains police. For more information on these rules, check the rulebook. The other basic action is to barricade. This is done by using a die of any value as well. The player chooses a district where they have 2 or more blocs located that are not in a clash. They then may place a barricade between the district and any adjacent district. Let’s move on to advanced actions. There are 3 types of advanced actions; loot, build occupation and swap occupation. It should be noted that during the player’s turn, they are allowed to gift or trade loot cards with any other faction that has blocs in the same district as their blocs. This is a free action that does not require a die. Advanced actions require an action die that is equal to or greater than the difficulty of the district that the action is being taken in. A reaction roll is then taken after each advanced action. A reaction roll is done by rolling the reaction die. This shows if the police respond. The higher the roll the better for the player. For more information on reaction rolls, check the rule book. The first advanced action is loot. To loot, the player chooses a district that has a shopping center along with 1 or more of their own blocs that are not in a clash. 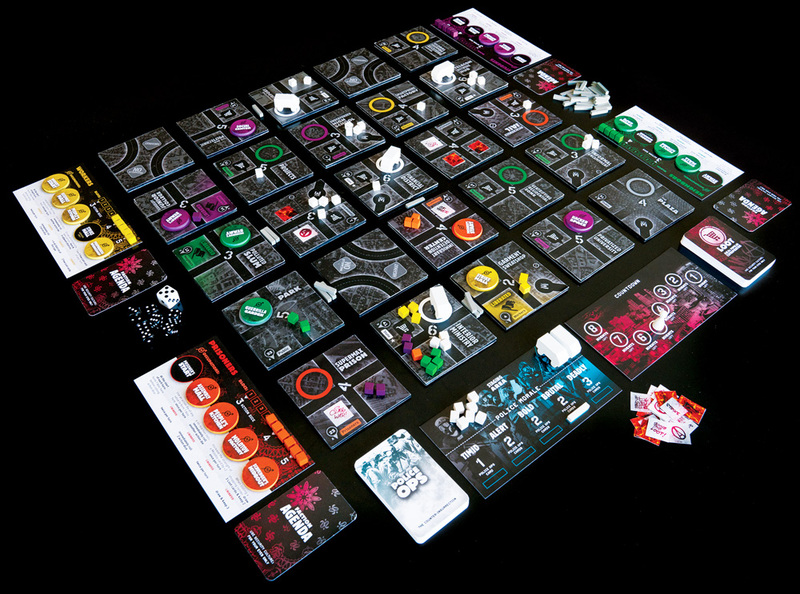 The player then draws a loot card, places the loot token and makes a reaction roll. Shopping centers may be looted twice before they are burnt and unable to be used again. The next advanced action is build occupation. To do this, the player chooses a district that has an occupation circle and one or more of their blocs that are not in a clash. The player then chooses an occupation from their faction mat and places it in that district’s occupation circle and then makes a reaction roll. This gives the player an ongoing ability that can be used each turn. The last advanced action is swap occupation. To do this, the player chooses one of their faction districts, a public district or a state district that has an occupation built in it and also contains one or more of the player’s blocs in it that are not in a clash. The player then removes the current occupation in the district and replaces it with one of their choice from their player mat. A reaction roll is then performed. The removed occupation is returned to it’s owner’s faction mat. It should be noted that a faction that has the most blocs in a district may stop other factions from taking advanced actions in that district. Let’s move on to attack actions. There are 3 types of attack actions; defeat a riot cop, kick out 2 riot cops and attack a riot van. Attack actions, like advanced actions, require the player to use an action die equal to or greater than the difficulty of the district that the action is being taken in. A reaction roll is then made. It should be noted that only 1 reaction roll has to be made after all consecutive attack actions in the same clash. Also, each bloc can only attack one time each night. To defeat 1 riot cop, the player uses an attack action to defeat 1 riot cop and send it back to the staging area. To kick out 2 riot cops, the player uses an attack action to kick out 2 riot cops, moving them into an adjacent district. If they are kicked out through a barricade, the barricade is dismantled. To attack a riot van, the player uses an attack action to damage the riot van. This is shown by turning it on it’s side. The second attack on a riot van flips it upside down and the third attack destroys it, returning it to the game box. The third step of the sunset phase is the police ops. This step is taken after each player has taken their turn. To start off, the player must draw a number of cards based on where the police morale marker is at on the police morale track. This can be from 1 to 3 cards. Each card is read aloud one at a time and resolved. In many cases, these cards will move riot cops and riot vans into adjacent areas. For more information on riot cop movement, check the rule book. It should be noted though that barricades can stop riot cops from moving. 1 barricade will stop 1 riot cop. 2 barricades will stop half of the riot cops rounded down. 3 barricades will stop all riot cops. Once this step has been completed, play moves into the sunrise phase. The sunrise phase begins once all factions have taken their turns. This phase is made up of 3 steps; police repression, district liberation and next night?. The first step is police repression. This step follows 3 steps in order. First off any riot vans that were damaged are repaired and reset to their upright position. Next riot vans go on the offensive and attack. They defeat all blocs and evict occupations built in their current district. Blocs and occupations are returned to the player’s faction mat. Finally riot cops attack, performing one attack for each bloc. They start off by attacking blocs first and then occupations. When a bloc is attacked, it’s returned to the player’s faction mat defeated. 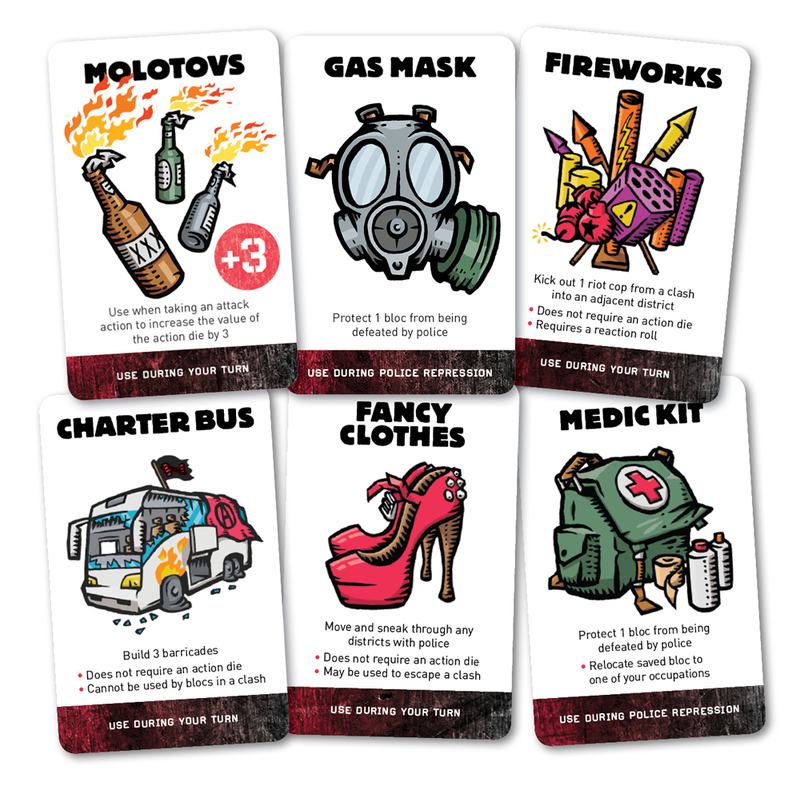 If there are no blocs in the district, the riot cop will evict an occupation if it’s present, sending it back to the player’s faction mat. Once this has been completed, district liberation begins. The second step of the sunrise phase is district liberation. It should be noted that there are several advantages to liberating a district. It reduces the district difficult by 1, It gives the occupation in the district it’s liberated ability, It allows the factions to draw the manifestation card beneath it and it reduces police morale. For more information on each faction’s occupation abilities, check the rule book. Liberation happens if 2 conditions are met. First, the district must have an occupation built in it. Second, the combined total number of blocs from all factions in that district must be equal to or greater than double the district’s difficulty number. If both these are present, the district is liberated. From there 4 steps are followed. First all loot tokens are removed and placed back in the pile. Blocs and occupations are set aside, not returned to the player’s faction mat. Next the manifestation card is drawn from beneath the district tile without changing the orientation of the tile. Third, the district tile is flipped over in the direction shown on the tile onto it’s “Liberated” side. The blocs and occupation are now returned to the tile. Finally the manifestation card is read aloud and resolved before returning the card to the game box. The final step of the sunrise phase is the next night? step. In this step, the players check to see if any endgame conditions have been met. If so, the game ends immediately. If not, the first faction marker is passed to the next player in turn order. The countdown marker is then moved forward and the next night begins. If no nights remain to move the marker on to, the game ends and the time runs out. The game can end in several different ways. In the beginning game, there are only two endings, success and failure. For the players to succeed in their insurrection, all state districts must have occupations built in them. If this happens, the players win. The players fail if any faction has no more blocs in the city or if the state districts have not been occupied before time runs out. In either case, the players lose. There’s absolutely a lot to like about the components in this game. First off there’s a ton of cardboard and wooden goodies packed inside the box. There are faction mats, a countdown panel and a police morale panel. These look absolutely great. I especially like the designs for the coundown and police morale panels. There are double sided district tiles, double sided loot tokens and a first faction marker. These are really durable. The loot tokens are especially cool looking with fire on one side and some grafitti on the other. I also really like how great the district tiles look and how cohesive they look when they’re all put together on the table, kind of like a city planning map or something. Next you’ve got wooden pieces for the riot vans, riot cops, barridaces, police morale marker, countdown marker and faction blocs. These are really sturdy and are brightly colored, especially the faction blocs. There’s also black action dice and a white reaction die. These are pretty much your normal average dice. Nothing spectacular but still good quality. Finally you have all the different cards. There are loot cards, police ops cards, agenda cards and manifestation cards. The artwork is great on these and looks awesome. I really love the way the game looks and feels. I love the design and theme. I’m thrilled with the game especially for one that didn’t come from one of the major publishers. You absolutely can not go wrong with the components in this one. The rulebook for this game is great as well. It’s got a really nice glossy finish to it that makes it pretty durable. The book is in full color, which I LOVE! There are rules for all player counts as well as for fully cooperative and semi-cooperatively. There are even rules for the beginner game which were covered in this review. There are tons of great pictures and examples throughout the book. I especially like the full page setup picture. This helps you get everything like it needs to be. There’s a really nice quick start section that runs you quickly through how to play. Also included in the rules are a guide for the districts, street, highways and metros as well as a random city generator for keeping the game fresh. Each step and phase of the game is laid out in great detail with tons of information and pictures. There’s a nice section dedicated to each faction’s occupation abilities which is a great addition. Finally the last 2 pages of the book go over the 10 scenario mini expansion that’s included with the game. Oh that’s right, I didn’t mention that earlier did I. Yea, the game has a mini expansion inside. Congratulations! You’re welcome! I’ve not had an opportunity to fully check all this out yet, just know…it looks cool. These ramp up the difficulty from intermediate to expert levels. Each scenario has rules and special setup instructions for how to play each one. If that wasn’t enough, the game comes with several cheatsheets that will help you play the game. These are really helpful and I’m glad they were included. Finally while we’re discussing books, there’s also a special little magazine included in the box. This gives some insights into the history of the game and where it drew it’s influences from. Look, I can’t find anything to complain about here. Overall, it’s a great looking rule book full of great information as well as some nice printed materials. I’m happy with the end results. The game is great. I really enjoy it. What else is there to say, that I haven’t already said before. Yes, the game is large. It takes up a ton of room on your table. You definitely want to be prepared for it. No little card table is gonna cut it here. I really like that the designers kept the original semi-cooperative aspect of the game but then added in a fully cooperative game style as well. You’ll explore all the different ways to play if you go through the different scenarios in the mini expansion. Not just that but there are ways to make the game easier as well as more difficult. Those rules are included in the rulebook and add a lot of replayability to the game. Not like the game wasn’t highly replayable anyway with the mini expansion and the variability in the way the board is set up. Yes it’s true that the agenda cards give a great sense of the traitor aspect that’s common in games like Dead of Winter. I really like how that works and the tension that you feel when playing semi-cooperative like that. Another thing that I’ve noted before was the length of the game. It’s definitely on the long side. You’re not gonna be able to just sit down and burn through a game in an hour. You need to be able to at least commit 2+ hours to this one. I realize that this will probably turn away some players. If I hadn’t already played this one before, it probably would have deterred me. However, don’t let it scare you. If you’ve played Eldritch Horror or something of that sort, it will emerse you into the game in the same way. Just be aware that the game is long but is completely worth the time spent. I really feel that war gamers will enjoy this one as well as fans of the traitor mechanic in games like Dead of Winter. The game is really unique and one that I feel will appeal to a wide range of players. I highly recommend that you give this one a try. It’s a truly amazing game that I enjoy a lot. Bloc by Bloc: The Insurrection Game is a rebellious game of area control that can be played cooperatively as well as semi-cooperatively. The game is quite lengthy with most game sessions lasting in excess of 2 hours. Some games will go as long as 3. I really like the look and feel of the game. The prototype was improved on quite a bit and everything turned out really amazing looking. I’m especially happy with the rule book and the included mini expansion. The game is a bit of a table hog so players with smaller tables beware. I really like the many different game play styles that were added to the final product to make a game that was already highly replayable, even better. War gamers as well as cooperative game fans should really enjoy this one. I also feel that fans of the traitor mechanic will like this one as well. This is a game that I highly recommend. Having been able to play the original prototype, I can say that this one outdid itself. The game is even better than before. It’s one that you will definitely be happy to have in your collection. Overall it’s a game that I enjoy and look forward to bringing out to the table as often as possible. For more information about this great game, please check out Out of Order Games at their site. This entry was posted in Reviews and tagged bloc, bloc by bloc, board, board games, card, card games, games, insurrection, Lee, order, out, out of order games, rocket, rocket lee, simons, tim, tim simons. Bookmark the permalink.